The Dallas-Fort Worth International Airport (DFW) has been ranked as one of the "Top Technology Airports" in the United States. One contributing factor is the completion of arguably the most intelligible public address and emergency voice/alarm communication systems (EVACS) in a domestic U.S. airport. While Public Address and EVACS have been around for many years, the design approach unifying them under one network-based infrastructure was significant. Starting in 2005, DFW’s renovation in International Terminal D was the beginning of a new standard. It has become the Next Generation Emergency Communication System for Mass Notification in the United States. AtlasIED was chosen due to its record of engineering excellence in mass transportation systems. Its new standard, called GLOBALCOM, provides high intelligibility, automation, monitoring, and system management for the airport's entire facility using a single network infrastructure. DFW is one of the nation’s largest and busiest hub airports, where up to 60 percent of all traffic is connecting passengers. Inclement weather in any area of the country affects flight arrivals and departures, flight crews, passenger connections, and more. In 2011, DFW started the Terminal Renewal and Improvement Program, which included remodeling existing Terminals A, B, C, and E to match the new Terminal D. Covering more than 4 million square feet, the system was engineered by design firm Ross & Baruzzini, and operates on an extensive network-based digital communication platform created by AtlasIED. 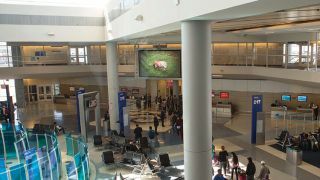 Ford Audio-Video was the chosen installation provider based on its experience, qualifications, licenses, and value-added services as one of the largest U.S. airport AV integrator. These firms collaborated to develop an entirely new airport audio experience for travelers, visitors, and employees that covers the entire airport facility, starting outdoors in the parking and curbside zones to indoor areas including check-in, security, terminals, gates, and dining retail spaces. This new approach provides automated information announcements to guide people around the airport with little human interaction. A new system benefit is automated security messages and music entertainment being broadcast into the public spaces based on the hour, day, or month. The DFW airport has specific announcements that can be dynamically changed based on time of day, weather conditions, and amount of travelers. For outdoor areas, it also provides automated security announcements throughout the day, improving outdoor public safety and creating a strong crime deterrent. One of the handsets that came as part of the AtlasIED system installed at the DFW Another first is the audio system’s performance. Chapter 24 of NFPA 72, the National Fire Alarm and Signaling Code, states that if the public address system and EVACS are merged, it must meet the code requirements, which includes intelligibility. This brings the performance of the EVACS and the clarity of the public address system together. The new system provides clear and highly intelligible messaging by pre-recorded or live notifications in all areas. There are many benefits to combining the systems, such as the increase in reliability and lower maintenance costs. The DFW Fire Training Research Center has conducted airport fire training for 27 countries, 29 states, and more than 15,000 firefighters. It takes pride in raising the bar for airport fire safety and readiness. When these systems were combined using the AtlasIED solution, there were many new solutions and cost-saving benefits. One advantage that a combined public address and EVACS provides is entire-facility monitoring. The Emergency Communication/Public Address System (EC/PAS) is always in use, which provides an additional level of monitoring. The EVACS is rarely actually activated. If there is a failure, the EVACS sends a signal to the Fire Alarm System, which is monitored by the dispatch center personnel and then reported to the IT staff. There is a requirement that the branch speaker circuits must be monitored at all times. AtlasIED was able to develop a method to control branch circuits that provide a means to convert existing systems. Another advantage of the combined system is that it operates on a converged network switching system, allowing network engineers to monitor the entire system, examine usage, and quickly be alerted to problems. The AtlasIED GLOBALCOM solution is a secure, managed, and proven converged network switching system. Additionally, the combined AtlasIED airport enterprise system allows for all the advanced functions, which have commonly operated only on the public address system, to incorporate emergency communications. In an emergency, the system can override regular announcements and pages to make sure the emergency announcements are carried out without distraction. Any emergency can halt hundreds of airport employees, thousands of travelers, along with planes, and other equipment. The AtlasIED airport enterprise system can quickly restore airport operations to regular activity, providing cost savings to the airport and airline carriers. Finally, the combined system offers an architectural advantage: a combined loudspeaker system is aesthetically better since there is no need for multiple infrastructures and separate endpoint devices. DFW’s new enterprise-wide communication system is changing the design and implementation of airport audio systems in the United States. This new, unified approach to a single communication platform that provides excellent intelligibility, automation, monitoring, and system management is inspiring more airports to plan on adopting similar systems. Currently, AtlasIED has systems deployed in more than 230 airports around the world, with more than 160 in the United States, and Ford AV has installed more domestic airport paging systems than any other AV contractor in the U.S.
To learn more about Ford AV, please visit fordav.com, and for AtlasIED, visit atlasied.com.